Voyager on her way leaving IJmuiden for the first time at the 8th of july 2013. The ship is slightly rebuilt from her days as a Crown Cruise Line ship, but she is still recognizable from her former years. 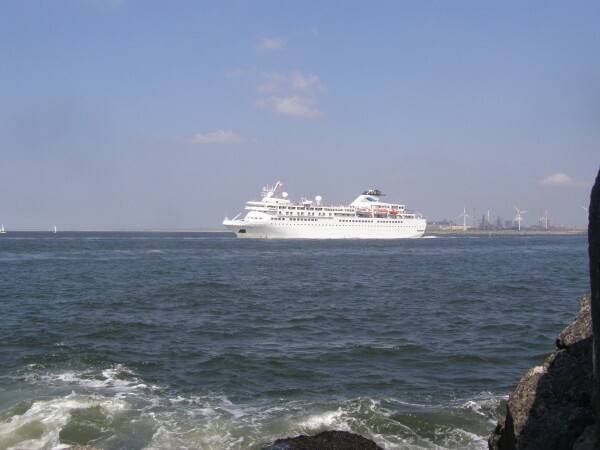 In 1984, the company Crown Cruise Line started operations as a luxury line offering cruises on a small yaught-like ship named Viking Princess. Crown Cruise Line was a division of the American company Grundstad Maritime Overseas Group. The ship operated short cruises from San Diego to the Mexican westcoast and the Baia California. In 1988, the company added their second ship, the rebuilt 1967-built ferry Las Palmas de Gran Canaria of the Spanish company Trasmediterranea. She emerged as the Crown del Mar after the rebuilding at the wharf that had built the ship, Union Naval de Levante at Valencia, Spain. Because of the anticipated success, Crown Cruise Line also ordered their first newbuilt. Convenient, they ordered this ship also from the same yard and she was launched in 1989 and delivered to the company in 1990. The connection to Union Naval was not only laid through their first ship. In the 1980's, the Spanish government had decided to add the F-18 fighterjet to their airforce and this jet is delivered from the American company Northrop. For compensation because of this order, Northrop had negociated for several American companies to have their order placed in Spain. Also through the Northrop negociations, Grundstad decided to order their ship from the Union Naval yards at Valencia. Of course, she was designed in the exact style that Crown Cruise Line wanted to have, with a small yaught-like style. Designed by GMO Design of Boca Raton, the 15.271 ton ship had 265 staterooms and suites, of which several suites offered even whirlpool tubs. When the 152,5 meter long ship was delivered, the company ended the lease of the Crown del Mar because the ship 'did not fit with the fresh image'. As Crown Monarch, the new ship started her sailings from Palm Beach to Key West and Jamaica, as well as Haiti, where Crown Cruise Line had the possession of a private beach. Also in 1990, to compliment the new ship, the company had built a terminal in the port of Palm Beach, measuring 45.000 square foot. It all seemed very well for the small company, you could say. All changed in 1991, when the Gulf War broke out and tourism plummited. Parent company Grundstad Maritime acted by splitting Crown Cruise Line in two companies, as Palm Beach Cruises the Viking Princess kept sailing day-cruises from Palm Beach, while the name of Crown Cruise Line as well as the ship was sold to Commodore Cruise Line, although Grundstad still provided management services for the ship. Commodore Cruise Line was an amalgamation between two Scandinavian companies, EFFOA (the Finland Steamship Company from Finland) and Johnson Line from Sweden. Together they had become Effjohn in may 1990. Because of the financial problems from Grundstad, Commodore had bought the Crown Cruise Line name and the Crown Monarch. They themselves had two cruiseships of their own built that were a little bit bigger then the former American owned ship, also at the Union Naval yards. These of course were the yet to become Crown Jewel and Crown Dynasty. Both were now also to be operated under the Crown Cruise Line name and recieved appropriate names. It proved that Commodore Cruise Line was very confident in the Crown Cruise Line name. This confidence ended in 1993, when also Commodore faced financial hard times and the Crown Cruise Line name, together with the management of the ships, was transferred again, this time to Cunard Line. They did operate the ships under a new brand named Cunard Crown Cruises and marketed the ships under their own names, just with a 'Cunard'-prefix. None of the ships were officially renamed in this style, though. During the mid 1990's, the Cunard management ended and the ships started to be scattered around the globe. 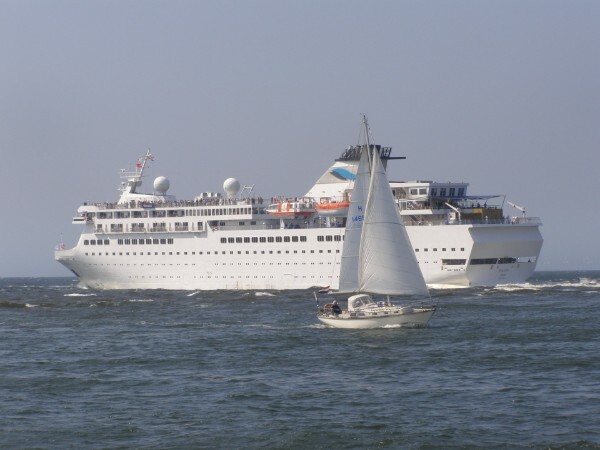 Crown Monarch was remaned Nautican for Crown Cruise Line, although she didn't see commercial service as such from 1994 onwards. She was sold in 1996 to the Hong Kong based Ki Devellopment Corp. and started casino cruises from Hong Kong. For this, she was named Walrus in 1996, Havens Star in 1997 and between 1997 and 2004 she traded under the name Neptune again. Another renaming followed, shen she became the Rembrandt II between 2004 and 2007. In those years, she was frequently in lay-up next to her casino cruises and it seemed her active cruiseservices were over. In 2007, she did see new cruise service though under the name Jules Verne for Vision Cruises, but this only lasted for one year. It opened the cruisemarket for her, as she was quickly chartered by the German-based Phoenix Reisen as a replacement for their Alexander von Humboldt that had been replaced in the fleet of Swan Hellenic. To make things easy, the ship was also renamed Alexander von Humboldt, although the former ship didn't leave the Phoenix fleet yet. Because of this, she was marketed as Alexander von Humboldt II untill the former one had left. 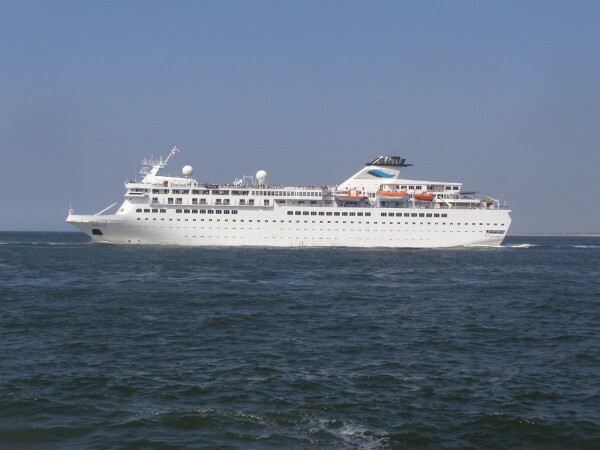 The former Crown Cruise Lines ship sailed for Phoenix Reisen untill the end of 2012, when she was replacing the Discovery in the fleet of Voyages of Discovery. For this, she recieved another new name, Voyager. After this namechange, she was allowed to be a part of a very exquisite club where only ships that have had ten names or more can be a member of. She has achieved this goal in a lifespan of just 23 years. A sad ending came in 2017, when All Leisure Group, the owner of Voyages of Discovery as well as Swan Hellenic Cruises was declared bankrupt and so both companies ended their operations. For Voyager, another operator had to be found and her also of course a good reason for her eleventh name. In march of 2017, just a few months already after the demise of All Leisure Group, the ship was bought by the Mexican company Grupo Vidanta and recieved the name of Vidanta Alegria. The company is one of the largest owners of hotels and resorts in Latin America and cruising is something new for them.